Latinos are early adopters of mobile phones and 28% more likely to own a mobile phone than non-Hispanic whites. How do Latina moms monitor mobile security risks? To find out, we recruited 270 Latina moms—150 had already purchased phones for their children and 120 are about to purchase a mobile phone for their child. We explored how Latino children use mobile phones and the ways their mothers monitor phone usage. The age children are given their first mobile phone is getting younger. The rapid adoption of smartphone technology and affordable family plans are leading to children being given access to mobile phones at earlier ages. For Latino children, the average age is 12. And in the next six months, 43% of moms surveyed are planning to get children younger than 12 years old their first phone. In some families, children as young as 5 years of age. While mobile phones may help Latino Moms manage children more effectively they also add a new parenting challenge. The two main reasons Latina moms have given for opting to get their children mobile phones are to: 1) track their children’s whereabouts and, 2) have the ability to communicate with them. The phones have become an important way for moms to manage their increasingly independent children. But conversely the phones have added a new and significant parenting challenge—ensuring that their children are using their phones safely and wisely. Moms are mostly concerned that their children may be wasting time, using their phone unwisely and accessing inappropriate content. Moms want a better way to manage their children cellphone usage. Latina moms are trying to meet this new parenting challenge by setting clear rules and monitoring usage. 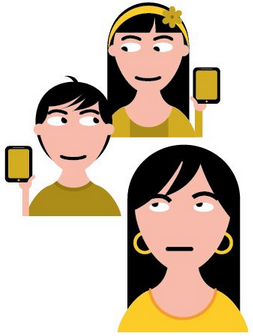 Today, 80% of Latina moms reportedly monitor their child’s mobile usage manually. 50% of the Latina moms who have already purchased phones are looking for a more effective way to monitor their child’s mobile phone usage. The number goes up to 69% among moms about to purchase a mobile for their child. Security features are becoming increasingly important purchase criteria for Latina Moms. The security features offered by carriers are becoming an increasingly important part of the purchasing decision for Latina moms. 65% of Latina moms with children with mobile phones would pick a carrier with better security at similar pricing for their next purchase. The number goes up to 78% among moms yet to purchase a mobile for their child. Expect to see Latina moms’ monitoring needs go up as children acquire mobile phones with more advanced features, and at earlier ages. The infographic is available in Spanish here. We worked with 20 Top Latina Bloggers, recruiting survey participants via their blogs and social media networks. All respondents were U.S. based Latina women with children who have mobile phones or who plan to get their child a mobile in the next six months. The study, sponsored by Sprint, features Sprint Guardian which offers bundled, value-priced services to keep your family safe and secure on their mobile phones. Social Lens Research conducted this study in partnership with iNSPIRE! For media requests, please contact Dora Valdez at dora@inspireculture.com. If you have questions about the research, please contact Julie Diaz-Asper at julieda@sociallensresearch.com. How do you think technology is impacting the average Latino family? 9/30 LATISM Party: It’s (Latinos in) Social Media Day!